Students prepare to celebrate the Sacrament of Confirmation during the 7th and 8th grades in our Religious Education program. Throughout this period, students participate in several preparation sessions, choose a Confirmation sponsor and Confirmation name. 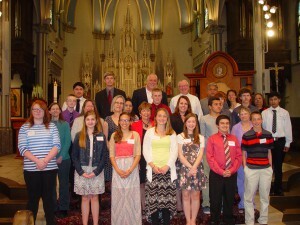 Following the completion of these sessions and service opportunities, the 8th grade students make their Confirmation with the Bishop of the Diocese of Grand Rapids at the Cathedral of St. Andrew in the spring.